Who doesn't love a donut! Even better, a yummy, healthier, homemade baked version! There is soooo much less fat than the fried versions you buy in donut shops. Donut pans with nonstick surfaces make it easy to make your own donuts fresh from your oven anytime. We served these cinnamon sugar donuts at our Christmas brunch along with lots of other delicious homemade goodies. The recipe comes from Sally's Baking Addiction, our go to baking guru. We love Sally's cookbooks and recipes! Find Sally's Baking Addiction books on Amazon These donuts have been made many times at our house. They come out perfect every time! What's great about making your own donuts is you have control of what goes in them. If you are allergic to cow's milk, you can use the milk of your choice. Soy milk, almond milk or coconut milk and soy or coconut yogurt work great in this recipe. 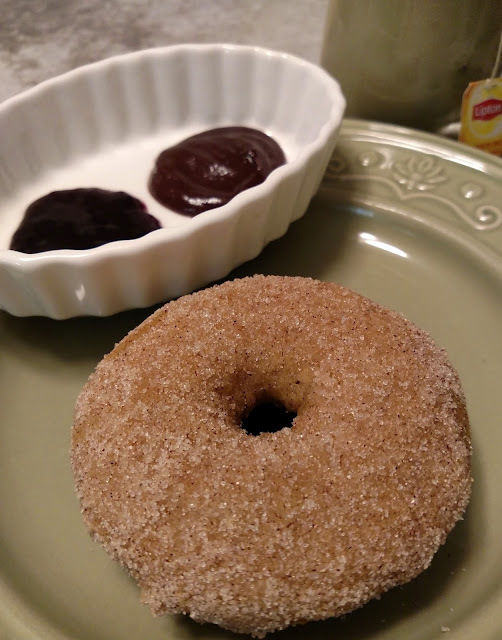 This yummy donut recipe, courtesy of Sally’s BakingAddiction, is quick and easy to make. My daughter, I call her my little baker, whips up a batch of 8 or 10 in about 45 minutes! Preheat oven to 350°F (177°C). Lightly grease or spray the donut pans with cooking spray and set aside. Whisk the flour, baking powder, baking soda, salt, cinnamon, and nutmeg together in a medium bowl. Set aside. Whisk the egg, brown sugar, milk, and yogurt together until smooth. Add the melted butter and vanilla, whisking until fully combined. Pour the wet ingredients into the dry ingredients and mix until just combined. Do not overmix. The batter will be very thick. Spoon the batter into the donut cavities or pipe them in using a plastic bag. Cut a corner off the bottom of the bag and pipe the batter into each donut cup, filling 2 ∕ 3 –3 ∕ 4 of the way full. Bake for 9–10 minutes or until the edges are lightly browned. Allow to cool for about two minutes and transfer to a wire rack set on a large piece of parchment paper or on a large baking sheet. Bake the remaining donut batter (there is usually enough batter for 1-2 more donuts) and once baked, transfer to the wire rack. Allow donuts to cool down until you can handle them. Combine the sugar and cinnamon in a medium bowl. Dip the donuts in the melted butter, then dunk into the cinnamon sugar mixture coating all sides. Donuts are best served immediately. Keep leftovers (if there are any!) covered tightly at room temperature for up to 2 days. Make ahead tip: You can freeze the donuts for up to 2 months. Thaw them overnight in the refrigerator and warm up for a couple seconds in the microwave. Even better, a little hot fudge and blackberry jam make fabulous dipping sauces. mmmmmmm!